Testing is an important part of the software development process. Writing unit tests and automating them as much as possible allows you to develop and evolve your applications quickly. In this server-side Swift tutorial, you’ll learn how to write tests for your Vapor applications. You’ll learn why testing is important, how it works with Swift Package Manager (SPM), and how to write tests for your application. Software testing is as old as software development itself. Modern server applications are deployed many times a day, so it’s important that you’re sure everything works as expected. Writing tests for your application gives you confidence the code is sound. Testing also gives you confidence when you refactor your code. Testing every part of your application manually is slow and laborious, even when your application is small! To develop new features quickly, you want to ensure the existing features don’t break. Having an expansive set of tests allows you to verify everything still works as you change your code. Testing can also help you design your code. Test-driven development is a popular development process in which you write tests before writing code. This helps ensure you have full test coverage of your code. Test-driven development also helps you design your code and APIs. Note: This tutorial assumes you have some experience with using Vapor to build web apps. See Getting Started with Server-side Swift with Vapor if you’re new to Vapor. This tutorial also assumes you have some experience working with the command line, Fluent, and Docker. For information on using Fluent in Vapor, see Using Fluent and Persisting Models in Vapor. If you’re new to Docker, check out Docker on macOS: Getting Started. Download the starter project for this tutorial using the Download Materials button at the top or bottom of this tutorial. The starter project contains a pre-built Vapor app named TIL (Today I Learned) that hosts user-supplied acronyms. When testing on macOS, Xcode links tests to a specific test target. Xcode configures a scheme to use that target and you run your tests from within Xcode. The Objective-C runtime scans your XCTestCases and picks out the methods whose names begin with test. You’ll need another approach when testing server-side Swift on Linux, since there’s no Objective-C runtime. There’s also no Xcode project to remember schemes and which tests belong where. This defines a testTarget type with a dependency on App. Tests must live in the Tests/ directory. In this case, that’s Tests/AppTests. This creates the XCTestCase you’ll use to test your users and imports the necessary modules to make everything work. Define some expected values for the test: a user’s name and username. Create an Application, similar to App.swift. This creates an entire Application object but doesn’t start running the application. This helps ensure you configure your real application correctly as your test calls the same App.configure(_:_:_:). Note, you’re using the .testing environment here. Create a database connection to perform database operations. Note the use of .wait() here and throughout the test. As you aren’t running the test on an EventLoop, you can use wait() to wait for the future to return. This helps simplify the code. Create a couple of users and save them in the database. Create a Responder type; this is what responds to your requests. Send a GET HTTPRequest to /api/users, the endpoint for getting all the users. A Request object wraps the HTTPRequest so there’s a Worker to execute it. Since this is a test, you can force unwrap variables to simplify the code. Send the request and get the response. Decode the response data into an array of Users. Ensure there are the correct number of users in the response and the users match those created at the start of the test. Close the connection to the database once the test has finished and stop the application to free up used resources properly. This sets the database port and name from the properties set above. These changes allow you to run your tests on a database other than your production database. This ensures you start each test in a known state and don’t destroy live data. This changes the container name and database name. The Docker container is also mapped to host port 5433 to avoid conflicting with the existing database. Run the tests and they should pass. However, if you run the tests again, they’ll fail. The first test run added two users to the database and the second test run now has four users since the database wasn’t reset. Set the arguments the Application should execute. Set up the services, configuration and testing environment. Set the arguments in the environment. Set up the application as earlier in the test. This creates a different Application object that executes the revert command. Call asyncRun() which starts the application and execute the revert command. Repeat the process again to run the migrations. This sets up the database on a separate connection, similar to how Vapor does it. Build and run the tests again and this time they’ll pass! The first test contains a lot of code that all tests need. You can extract the common parts to make the tests easier to read and to simplify future tests. This function allows you to create a testable Application object. You can specify environment arguments, if required. This removes several lines of duplicated code in your test. This uses the function above to create an application that runs the revert command and then runs the migrate command. This simplifies resetting the database in each test. This defines an empty Content type to use when there’s no body to send in a request. Since you can’t define nil for a generic type, EmptyContent allows you to provide an type to satisfy the compiler. Define a method that sends a request to a path and returns a Response. Allow the HTTP method and headers to be set; this is for later tests. Also allow an optional, generic Content to be provided for the body. Create a responder, request and wrapped request as before. If the test contains a body, encode the body into the request’s content. Using Vapor’s encode(_:) allows you to take advantage of any custom encoders you set. Send the request and return the response. Define a convenience method that sends a request to a path without a body. Create an EmptyContent to satisfy the compiler for a body parameter. Use the method created previously to send the request. Define a method that sends a request to a path and accepts a generic Content type. This convenience method allows you to send a request when you don’t care about the response. Use the first method created above to send the request and ignore the response. Define a generic method that accepts a Content type and Decodable type to get a response to a request. Use the method created above to send the request. Decode the response body to the generic type and return the result. Define a generic convenience method that accepts a Decodable type to get a response to a request without providing a body. Create an empty Content to satisfy the compiler. Use the previous method to get the response to the request. This function saves a user, created with the supplied details, in the database. It has default values so you don’t have to provide any if you don’t care about them. With all this created, you can now rewrite your user test. Open UserTests.swift and delete testUsersCanBeRetrievedFromAPI(). This reverts the database, generates an Application for the test, and creates a connection to the database. This test does exactly the same as before but is far more readable. It also makes the next tests much easier to write. Run the tests again to ensure they still work. Create a User object with known values. Use getResponse(to:method:headers:data:decodeTo:) to send a POST request to the API and get the response. Use the user object as the request body and set the headers correctly to simulate a JSON request. Convert the response into a User object. Assert the response from the API matches the expected values. Get all the users from API. Ensure the response only contains the user you created in the first request. Run the tests to ensure that the new test works! Save a user in the database with known values. Get the user at /api/users/<USER ID>. Assert the values are the same as provided when creating the user. This creates an acronym and saves it in the database with the provided values. If you don’t provide any values, it uses defaults. If you don’t provide a user for the acronym, it creates a user to use first. let acronymLong = "Oh My God"
Create a user for the acronyms. Define some expected values for an acronym. Create two acronyms in the database using the created user. Use the expected values for the first acronym. Get the user’s acronyms from the API by sending a request to /api/users/<USER ID>/acronyms. Assert the response returns the correct number of acronyms and the first one matches the expected values. Run the tests to ensure that the changes work! Like the other model helper functions, create(name:on:) takes the name as a parameter and creates a category in the database. 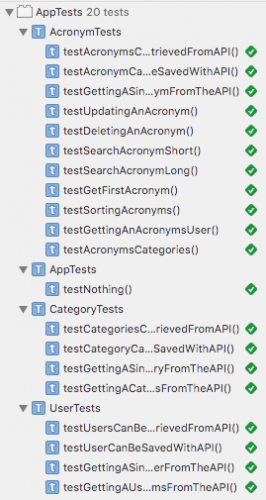 The tests for the acronyms API and categories API are part of the starter project for this tutorial. Open CategoryTests.swift and uncomment all the code. The tests follow the same pattern as the user tests. Open AcronymTests.swift and uncomment all the code. These tests also follow a similar pattern to before but there are some extra tests for the extra routes in the acronyms API. These include updating an acronym, deleting an acronym and the different Fluent query routes. Run all the tests to make sure they all work. You should have a sea of green tests with every route tested! You can download the completed project for this tutorial using the Download Materials button at the top or bottom of this tutorial. In this tutorial, you learned how to test your Vapor applications to ensure they work correctly. Server-side Swift apps are typically deployed to Linux, and writing tests for your application means you can run these tests on Linux. This gives you confidence the application will work when you deploy it. Having a good test suite allows you to evolve and adapt your applications quickly. To learn about testing Vapor applications on Linux, see Server-Side Swift: Testing on Linux. Vapor’s architecture has a heavy reliance on protocols. This, combined with Vapor’s dependency injection Service framework, makes testing simple and scalable. For large applications, you may even want to introduce a data abstraction layer so you aren’t testing with a real database. This means you don’t have to connect to a database to test your main logic and will speed up the tests. It’s important you run your tests regularly. Using a continuous integration (CI) system such as Jenkins or Bitbucket Pipelines allows you to test every commit. You must also keep your tests up to date.